MOSCOW, the Russian Federation, (BulgarianMilitary.com) – Yesterday, the Ministry of Defence of the Russian Federation announced that the local Pella Shipyard, based in Saint Petersburg, will float out the fourth Project 22800 small missile corvette on 23 October, learned BulgarianMilitary.com. 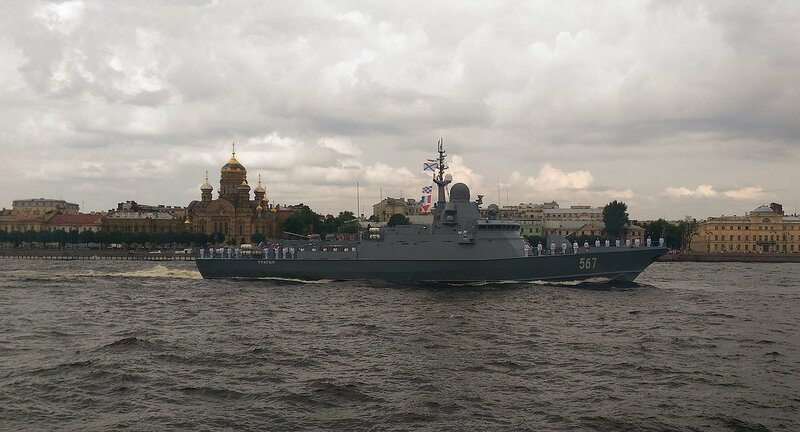 The name of the new Karakurt-class corvette is Burya, by the order of the current Commander-in-Chief of Russian Navy Admiral Vladimir Korolyov. The launching ceremony will be held with the participation of official representatives of the Russian Navy’s High Command, St. Petersburg Administration, shipbuilders, and R&D organizations. Burya was laid down on 24 December 2016 and is planned to be commissioned in 2020. The new Karakurt-class ship differs from the first two of the class, because of its Pantsir-M anti-aircraft missile-gun complex, instead of the AK-630 artillery mounts. The Project 22800 Karakurt-Class corvettes has been established by the Russia’s Defence Ministry in 2015, after an announcement of the Former Deputy Defense Minister Yuri Borisov about the plans of the department to order ocean-class small ships for the Russian Navy. The project has been conducted in accordance with the State Military Shipbuilding Programme and its aim is to modernize the surface component with high-precision weapons carriers. Since the beginning of the project, the Russian Ministry of Defense has awarded several contracts for the supply of Navy’s new class corvette, to Pella Shipyard and the shipbuilding company Zelenodolsk Plant. The last contract for the new missile ships has been awarded to the Amur Shipbuilding Plant, in August 2018, during the International Military-Technical Forum ARMY 2018. Under this contract, the shipyard based in eastern Russia, is responsible for the delivery of 4 corvettes of the class, which are planned to be commissioned in 2022. Under the Project 22800, Russia has ordered a total of 18 corvettes, which to be deployed in the Russian Navy’s Baltic Fleet, Black Sea Fleet, Northern Fleet and the Pacific fleet by 2022. So far, the first and the second corvette, named Uragan and Typhoon, have been launched in 2017, with the third ship of the class, Shkval, being floated out, by the manufacturer, in May, this year. Project 22800 small missile ships are designed by the Central Marine Design Bureau Almaz. They are planned to be equipped with a system of high-precision missile weapons and modern artillery systems. Karakurt-Class corvettes feature improved capabilities, such as high mobility and manoeuvrability, enhanced seaworthiness as well as superstructures and hulls the based on low reflectivity technologies. The displacement of the ships is 800 tons and their speed is over 30 knots.